I am still jet lagged after 2 longhaul flights but we were running out of bread. so over the weekend I dug my starter out of the refridgerator, refreshed it and then built enough 100% hydration levain for 2 loaves. I used some bran left over from earlier bakes as well. My brain isn’t yet upto much so I stuck with the 1:2:3 formula making 1 all white loaf and 1 loaf with 25% rye. After 30 minute autolyse I added levain to the rye dough, mixed it a bit then did 100 SLAFs. Dough was quite sticky but came together well enough. At this point I left it to rest and repeated the process on the white dough. The white dough was very soft but easy to work with. Now I went back to the rye dough, added salt with about a tspn extra water and did another 100-110 SLAFs. Dough much better now, not so sticky and the little extra water helped with the texture. Left to rest while I repeated the process with the white dough but did not need to add any further water. During bulk ferment I did 4 sets of coil folds 30 minutes apart then left dough to did it’s thing. Once dough was looking a bit poofy, I decided I had to risk it as the jet lag was kicking in again so I preshapped and bench rested for 30 minutes. I tried extra hard with shaping - trying for good structure so dough would hold it shape. Planned on bench rest of at least and hour after shaping but at 45 minutes I hit the wall and needed to go to bed. so popped both lots into he fridge and baked them early this morning. Preheated oven to 250°C but turned it down to 225° C with convection, 15 mins lid on DO and 15 mins lid off. Really happy how they came out of the oven. Cut one for lunch too. Crumb shot. left hand one is 25% rye. Happy with the crumb on both. Yes they were both simple loaves but I paid extra attention to several things. 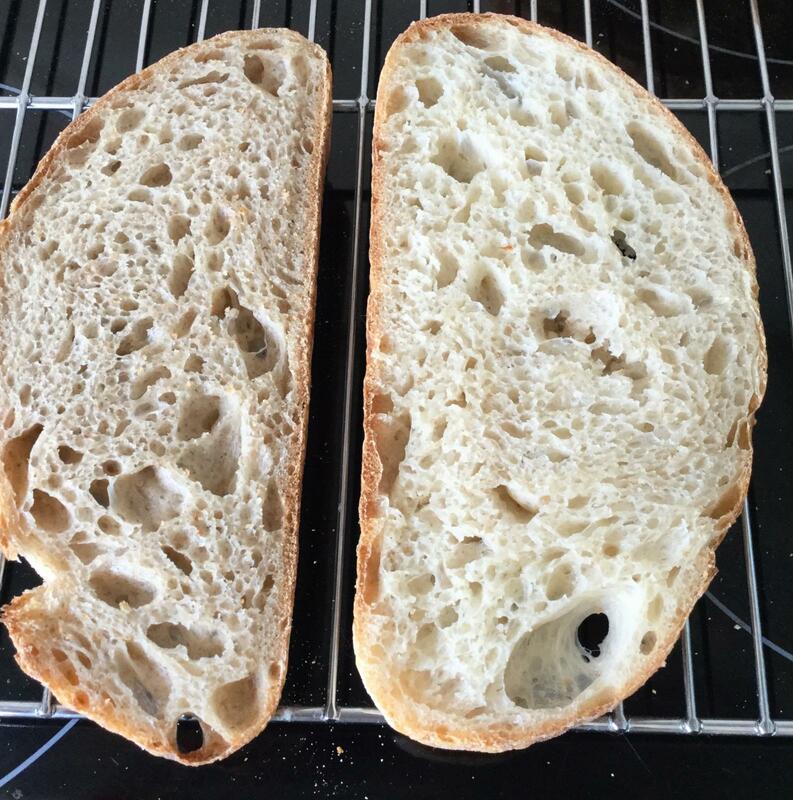 Maturity of levain - not sure if I understood this right, will reread but the overal levain weight had dropped by 2 grams and it certainly looked good to use. The number of slap and folds. Last bake I did 300 SLAPs but felt it was too many so dropped back. I think it is better this time. Timing of salt addition. Normally I would add salt when I add the levain. This time I did it i. the middle of the SLAPs and I could see the dough tightening up. Shaping - really keen to get good volume and height and minimize spreading. The white in particular had come out well with nice rounded shoulders. The rye one a little flatter but not too bad. Final proof - my fridge is colder these days and I think fermentation is slowing a bit to fast. I think the bench rest after shaping before retarding is helping. So still much to think about, but overall this was a good bake. It is sooo good to bake again. I hope you feel better and to bake some amazing bread with a crumb like that being jetlagged is quite a result! I also looooove the blisters. The crumb in both looks so nice, soft and fluffy! Yum!